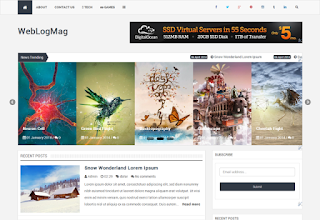 WebLogMag Responsive Blogger Template is a professional blogger template for business blogs, magazines and simple news sites. Weblogmag is coming with plenty of features which makes it easy for us to improve user experience. It is coming with an awesome slider and new ticker along with a recent posts widget. Спасибо за шаблон. Сделал блог на русском. Дата - формируется на английском и задваивается слово "комментарий", видимо работает механизм и шаблона и самого блоггера.